It's ironic that a city famous for its old-fashioned liquor laws owes its origins to an unlicensed saloon. Back in the mid-1800s, New Westminster was the Lower Mainland’s only bustling city while the area now known as Gastown was a sparsely populated neck of the woods called Luck Lucky (or Luk’luk’i, meaning “grove of maple trees”) by the Coast Salish people and populated primarily by a few dozen millworkers. This all changed in 1867 after a Yorkshireman and former Fraser River steamship captain by the name of John “Gassy Jack” Deighton pulled up in a canoe with a barrel of whiskey and told locals they could drink their fill if they helped build him a pub. The story goes that the Globe Saloon — located near where a statue of its founder now stands at the corner of Water Street and Carrall — was open for business less than 24 hours later, and a makeshift community soon sprung up around the new watering hole that became known as Gassy’s Town. A massive fire burnt the settlement to the ground in 1886 but a new community quickly reappeared due to the arrival of the transcontinental Canadian Pacific Railway on the nearby waterfront the same year. The actual boundaries of Vancouver’s earliest neighbourhood aren’t strictly defined but are generally considered to stretch eastward from Richards Street between Water and Hastings streets as far as Main Street. 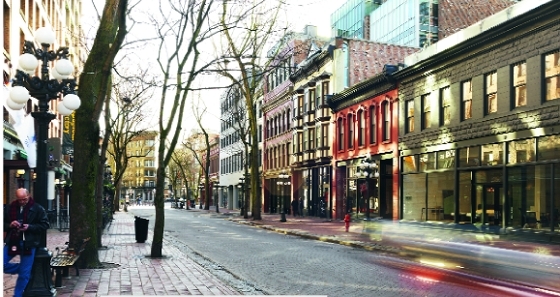 Gastown eventually fell on hard times after becoming overshadowed by the downtown area and was set to be demolished back in the ‘70s until a group of citizens successfully lobbied the city for a heritage preservation order. A dedicated effort to clean up the area has since pushed the grittier elements to the Downtown Eastside. While some decry the gentrification of the city’s historic district, whose cobblestone streets and antique street lamps provide a one-of-a-kind ambience, others take pride in the area’s recent emergence as both a tourist attraction and hotspot for upscale businesses and restaurants.